I cought most of the VP debate last night. It was hard to find the time to cook (i made 4 – yes 4 – quiches and a huge batch of carrot soup), watch “Making the Cut” with my hubby, and watch the re-airing of Desperate Housewives (i was kicking myself for having missed the first episode), and watch the debate. Thank goodness for time shifting. I thought, that’s weird. How could they never have met?? And, after a little investigation, I discovered that they had met, several times. 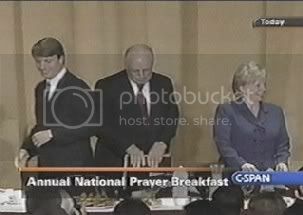 On Feb. 1, 2001, the vice president thanked Edwards by name at a Senate prayer breakfast and sat beside him during the event. On April 8, 2001, Cheney and Edwards shook hands when they met off-camera during a taping of NBC’s Meet the Press, moderator Tim Russert said Wednesday on Today. On Jan. 8, 2003, the two met when the first-term North Carolina senator accompanied Elizabeth Dole to her swearing-in by Cheney as a North Carolina senator, Edwards aides also said. Three times in how many years? And one of those times is based on the word of Edwards’ aides and a photograph that shows Edwards behind Cheney? Not very impressive evidence that Senator Edwards was making his mark on the Hill. Considering that Edwards insisted on going back to previous questions to address remarks from Cheney – despite the moderator’s attempt to move to a new topic – I would have expected Edwards to go back and state he’d met Cheney before, if he had remembered meeting Cheney before. That would have been a perfect opportunity for Edwards to zing Cheney. Too bad even Edwards couldn’t remember having met Cheney before the debate. That, all by itself, is most damning to Edwards. yeah yeah. I’m not going to fight about it. Both vp candidates had their lows and highs last night. Since I know you are a Republican, i knew I’d get a comment out of you today!! Thanks 🙂 I wish more people would comment!! I’m actually Independent – but I lean heavily toward the Republican platform. My wife thinks I’m just fooling myself by saying I’m independent, but I think I could vote for a Democrat. I would have probably supported Joe Lieberman for President if his party had been smart enough to nominate him.